Profit of Education | The economic evidence on education reform. Me in the LA Times on raising teacher pay. One of the great accomplishments of the late 20th century was to bring women onto a more equal footing in the labor market. Salaries became more equal. Employers opened up jobs for women. Educational opportunities became more gender-equal. And for college-educated women, all of this meant that careers outside teaching and nursing became possible. One might think that as more career paths opened—even if not opened all the way—increased alternatives would have meant relatively fewer women in teaching. In fact, that is not what happened. As we celebrate Women’s History Month, we look at how one of the very few historically female-dominated professions has become even more so. Here, I briefly describe what did happen and offer my explanation as to why. Unlike with most jobs, teacher salaries have long been based on a schedule that minimizes opportunities for discrimination. Little matters for salary other than years of experience and level of education. (Oh yeah, and whether you teach in a district with high or low salaries.) So women and men get almost equal pay. In the most recent available data, base pay for female teachers was 96 percent of the pay received by male teachers. Even if you include extra school pay above the base level (for extracurricular activities, coaching, and a few other things), women still earn 93 percent of what men earn. High school teachers get paid somewhat more than elementary school teachers, and men are more likely than women to teach at the secondary level. But women teachers have slightly more education than men do. While the gender pay gap has not yet been fully eliminated, it is smaller for teachers than in most of the economy. As a rough comparison, in “management, professional, and related occupations,” the Bureau of Labor Statistics reports that women earn 73 percent of what men earn. While a large majority of teachers are women, a majority of these management and professional workers are also women. The difference in the wage gap is much smaller in teaching, making teaching especially attractive to women. What about in the not-so good old days? It’s hard to get exactly comparable data, but reports from the 1970 census suggest the male-to-female earnings ratio for year-round workers with four years of college was 55 percent. (Something else from the old days: the reports are all separated by race. The 55 percentage is for whites only.) In contrast, teaching salaries have been approximately equal by gender, although not perfectly equal. The earliest year for which I was able to track base teaching salaries was 1987, when the salary gender ratio was 0.89. In other words, women’s and men’s teaching salaries have long been almost equal. Outside teaching, earnings are far less equal—but they’re a lot closer together than they were in past decades. So what would you expect to happen to the relative number of women and men in teaching over this period? It used to be that few opportunities outside of teaching were available and women had equal-ish pay, which incentivized talented women to go into the classroom. Now with a more open world, the incentives for women to teach are lower, so relatively fewer will become teachers and the gender balance in teaching should become somewhat more equal. At least that’s what I thought. It turns out that I was wrong and, in fact, the opposite has happened. Here’s a picture of the proportion of female teachers over time. Source: The Current Population Survey via IPUMS USA, University of Minnesota, www.ipums.org. Additionally: The National Center for Education Statistics’ Schools and Staffing Survey via The Department of Education. The green line tells the real story. The share of teachers who are women rose, not fell, over the past three-plus decades. The proportion rose quite a bit through some time in the 1990s and then has edged up a bit more since. Now some more explanation about the graph. The solid lines are taken from the Current Population Survey (CPS)—a representative survey of the U.S. population—and look only at full-time teachers. The dots are taken from the Schools and Staffing Survey (SASS), which is a survey of teachers only and does not reach back quite so far. The SASS trend is also upward, but somewhat less dramatically so. We can split out a few more details using the CPS data. 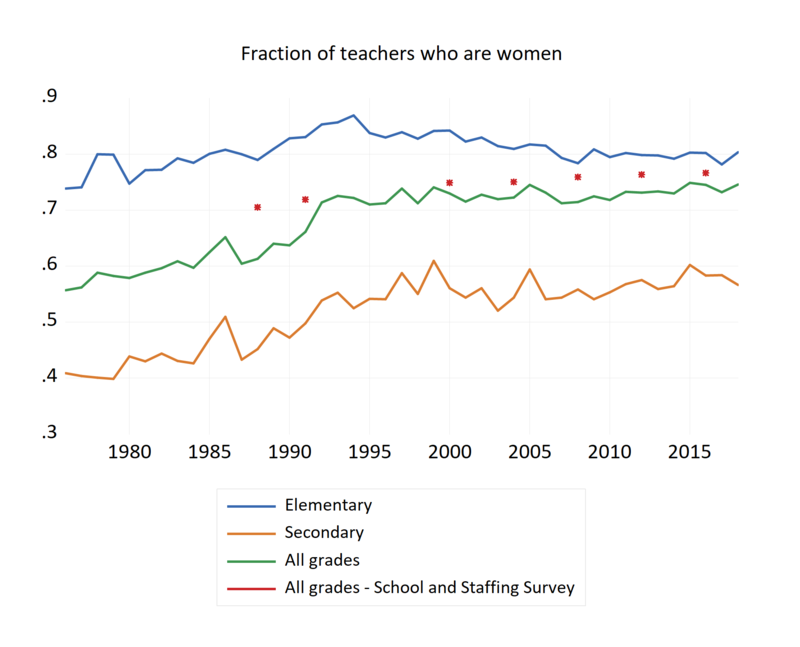 The blue line at the top shows the female share for elementary school teachers: unsurprisingly, heavily female. The percentage moved up some through the 1980s, then back down a little. Overall, it has been pretty flat over time. Elementary school teachers are overwhelmingly women, both historically and today. The orange line at the bottom tells us the real change in the female share is in secondary school. Teaching secondary school used to be a majority male occupation, and today a solid majority of secondary school teachers are women. Notably, the majority of math and science teachers in grades nine through 12 are women. Probably a small piece of the story as to why women’s share in teaching has risen rather than fallen is that secondary school teaching jobs have become more open to women. Here’s what I think is going on: While it’s true that the relative attractiveness of teaching versus other careers has declined for women versus men, there has been an enormous increase in the number of women with the basic required education to be a teacher—a bachelor’s degree. 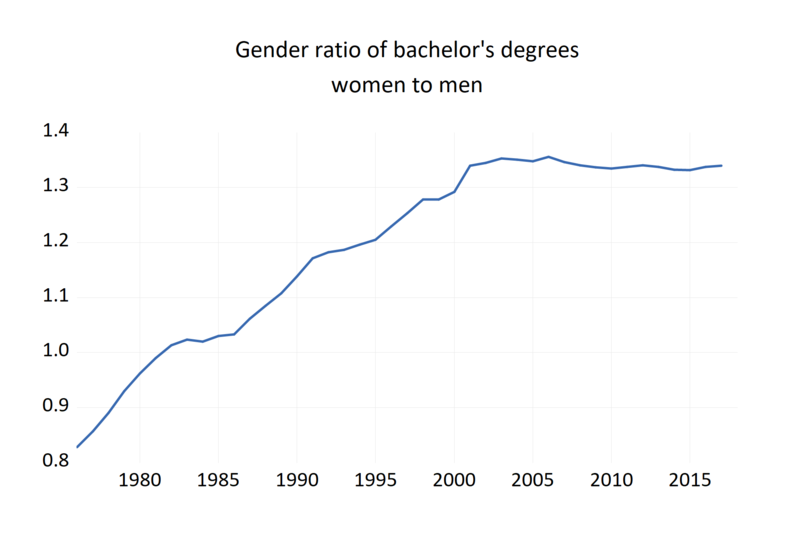 The picture below shows what happened over the last 40 years; the ratio of bachelor’s degrees going to women relative to men has risen by 60 percent. In other words, the greatly increased number of women in the qualified labor pool for teaching overwhelms any effects of changed incentives of teaching relative to other professions. (Ingersoll et. al. provide a very readable report on these and other trends in the teacher workforce; also see the nice summary in the Atlantic.) From an economics point of view, it is interesting that the quantity effect dominates the incentive effect. Source: The National Center for Education Statistics’ Schools and Staffing Survey via The Department of Education. But I’d place one big caveat on the conclusion that teacher gender doesn’t matter. Most of what we know about the effects of teacher gender are about what happens in K-12. As you’ve seen in the chart above, there has been a massive change in college attainment of men versus women—and though everyone looks at four-year degrees, the change in associate degrees is just as large. Interestingly, the large increase in the fraction of college degrees going to women is a worldwide phenomenon. And perhaps not coincidentally, women as a fraction of the teaching force has increased in other developing countries as well. The table shows the increase in the fraction of teachers who are women in the OECD. (Note that the comparison is not perfect, as the set of countries included changed a bit over these two decades.) What we see is that the change in the teacher gender ratio—including in secondary school—is not just a U.S. phenomenon. The “coincidence” of a shift to relatively more women going to college during a period in which students also had relatively fewer male teachers is interesting. One possibility is that high school boys are in need of male role models to keep them on track to college. Another possibility is that it’s the decline in discriminatory barriers that has led to both more women teachers and to more women going to college. Evidence on how much either explanation contributes to the changes we’ve seen will have to await further research. Back in October I asked why universities continue to produce so many humanities PhDs in the face of the abysmal humanities job market. The flip side of that question is to ask why young scholars are willing to invest so much of their lives in earning a humanities PhD. I hope the answer is that it’s their love of the subject, because it surely isn’t because of the economic return. Let’s begin with the economics of getting that PhD. The NSF surveys new PhD recipients and asks them how much debt they acquired in graduate school. The figure below shows that humanities (and art) PhDs fare worse than STEM students. Just over half of humanities students escape with a degree without having acquired more debt in graduate school. In physical sciences, math and computer science, and in engineering about 80 percent avoid graduate student debt. Probably more important, more than a quarter of humanities PhDs end up with over $30,000 in new debt. For life sciences the percentage is about half that and in other STEM fields the fraction with large debts is a quarter of the rate for humanities and arts. There is also the “opportunity cost” of being in graduate school. Graduate school stipends are a lot lower than pay after earning the degree. Humanities degrees take longer to get than do STEM degrees. On average, one to two years longer. That’s a lot more foregone earnings for humanities students. How about employment on graduation? Unsurprisingly, humanities PhDs are less likely than STEM graduates to have post-graduation plans lined up. But the difference is not all that large. In the humanities and arts, 43 percent of students reported to the NSF that they had no definite commitment. In math and computer science that fraction was only 27 percent, and in engineering the same number was 36 percent. The NSF also asked doctoral recipients who had definite plans whether the next step was a job or postdoctoral study. Of the humanities grads who had plans, the next step was overwhelmingly employment—only 21 percent were headed to post-docs. In the physical and life sciences, 3 out of 5 students went the post-doc route. The real difference after graduation? Among humanities and art students who do have jobs lined up, the vast majority are going to work for colleges and universities. In contrast, STEM doctorates very often go to work for business or industry. Working for a university is not a bad outcome (I mention in case my employer is reading this), but industry certainly pays better. Here’s a figure with the breakdown from NSF data. For those new PhDs with an employment commitment after graduation, the NSF surveys expected annual salaries. In life sciences, the median is $80,000. (I report male salaries here; salaries for women are 15 percent lower.) Median salary in physical sciences is $86,000. Math and computer science is $113,000. Engineering is $100,000, and in economics the median salary is $100,000. In humanities and arts, the median expected salary is $52,000. So it’s the salary levels that make the biggest difference between the humanities and STEM fields. The NSF data is informative about the very beginning of a career. To learn more about economic returns over a lifetime, we can turn to the American Community Survey. (One caveat here: The ACS identifies fields by undergraduate degree, so there is no doubt some minor error in classifying degrees.) Here is a graph of median income in the humanities and STEM at both the BA level and the PhD level. The basic message is that a student with a humanities PhD earns about the same salary as a STEM BA. Some of this is because of the different employment venues, but even within colleges STEM PhDs earn more than do those in the humanities. Humanities PhDs working at a college or university have a median income of $72,000. The STEM figure is about 13 percent higher. I’ve made a graph of the distribution of salaries for PhDs who work at colleges and universities (Wonk note: the picture is from what’s called a “kernel density” estimate.) What you can see is that that humanities PhD salaries in higher education are mostly between fifty and a hundred thousand. In contrast, about a third of STEM PhDs earn over 100K. About a third of humanities PhDs employed outside of higher education earn over $100,000. For STEM grads, the number is more like 60 percent. Putting it all together, getting a doctorate in the humanities doesn’t seem to be a great dollars-and-sense investment. If it’s a labor of love—and if students heading into these doctoral programs are fully informed—then it can still be a perfectly sensible career choice. I’m not so sure about whether prospective students are “fully informed,” but on that there’s no evidence other than anecdote. What I am sure about is that the rest of us continue to benefit from the young scholars who choose to sacrifice financially to transmit understanding of poetry and history and philosophy to the next generation. If you have been anywhere near a university that trains doctoral students in the humanities, you will know that the market for new Ph.D.s is abysmal. The plain fact is that we train far more humanities Ph.D.s than there are jobs for. In a recent year, the American History Association reported about 340 tenure-track job openings for historians, plus maybe another hundred jobs outside history departments that might recruit a historian. In the same year, American universities minted about 1,150 new Ph.D. historians. In economics, there were 2,650 new jobs and about 1,250 new Ph.D.s. The contrast is stark and largely typical of the situation in humanities versus STEM fields. In part, this is not new. The “crisis” has been going on for an academic lifetime—at least since the 1970s. Academics who started their career when the Modern Language Association first reached the “melancholy conclusion” that, “should present trends continue, life … particularly in the humanities, could turn grim indeed,” well, those academics have now mostly retired. I want to talk about some possible reasons why more humanities Ph.D.s are produced than there are jobs for, especially in light of how long we’ve been in this dismal situation. First though, I want to raise a concern that conditions may be moving from dismal to disaster. 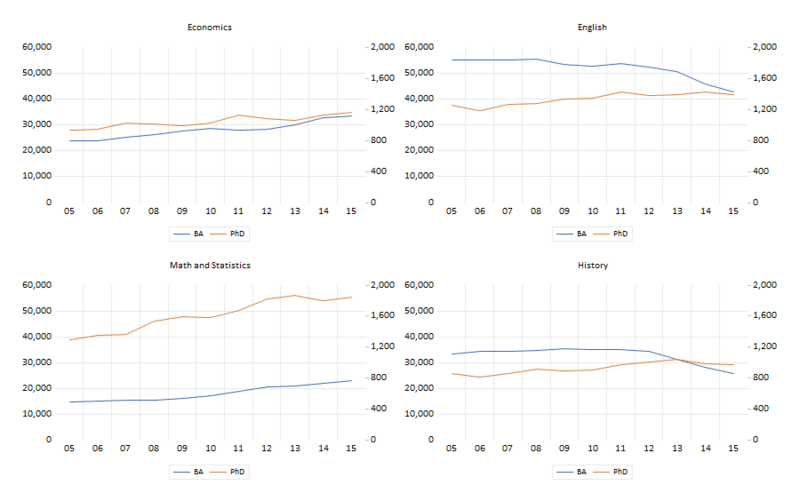 Here are four graphs showing the most recent 10 years of data for the number of bachelor’s degrees (in blue) and the number of doctorates (in red) across economics, English, math and statistics, and history. The count of the former says a lot about the demand for the latter. Look at economics and math/statistics on the left side of the figure. The number of bachelor’s degrees has grown, and the number of Ph.D.s has pretty much grown in parallel. Now look at English and history on the right. 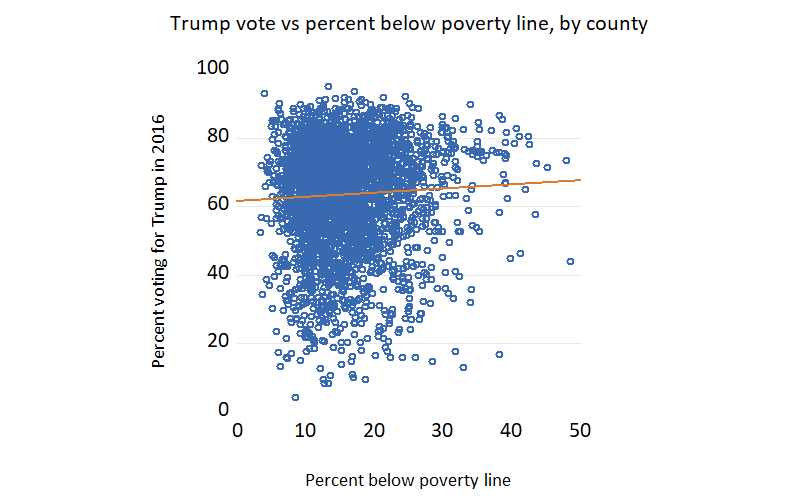 For the first half of the graph, the number of B.A. degrees was flat while the number of Ph.D.s grew rapidly. More recently, the number of bachelor’s granted in a year has plummeted while the number of doctorates has leveled off. One wants to be careful about extrapolating from five years, or even a decade. Nonetheless, things don’t look good. Why do the gaps matter? Because a big part of the demand for Ph.D.s in an area is to provide teaching for students pursuing their bachelor’s. The economic problem in the humanities market is too much supply chasing too little demand. While one may lament the too-little demand, we’re left with the question of why supply hasn’t adjusted. Why do universities keep training so many humanities Ph.D.s when their market is so weak? It helps to understand that decisions about the number of Ph.D. students to admit are partially at the discretion of individual academic departments and partially decided by the choice of university administrators about how much money to allocate to a given department. It’s worth pointing out that resource allocations change very slowly in universities (but that’s slow on a scale of years, not slow on a scale of decades.) Let me suggest some reasons why universities continue to churn out so many Ph.D.s in the humanities. Graduate students are cheap labor for teaching undergraduates, grading papers, etc. The suggestion is that it’s cheaper for universities to hire graduate students than to hire faculty. Maybe, but I am less than enamored of this explanation because of the arrangements of salaries in research universities—which is where Ph.D.s are trained. Teaching assistant (TA) salaries are often set across the board, so they are the same in humanities and STEM disciplines. (More or less, as STEM fields are more likely to provide some supplements to TA pay. The “across-the-board” pattern is generally stronger in universities where the teaching assistants are unionized.) On the other hand, STEM faculty salaries are a lot higher than humanities faculty salaries. So if it’s a “cheap labor” argument, the excess supply should show up in STEM rather than in the humanities because the faculty/TA salary gap is larger there. Graduate students are necessary for research and scholarship. Universities bring in humanities Ph.D.s to keep humanities faculty productive. I suspect there is something to the need for graduate students to support research. And that makes it a valid reason, at least it makes it a valid reason for the university. Graduate students may not be necessary, but humanities faculty really like to teach graduate courses. Humanities departments accept too many Ph.D. students in order to justify teaching graduate courses. This is the explanation that I mostly believe, and this is also the explanation that I have no hard evidence for whatsoever. Just to be clear, economists also often like to teach graduate courses. I’m not suggesting any difference in attitudes or desires among humanities faculty versus STEM fields. The difference is that after coursework and after dissertations STEM Ph.D.s get jobs. Faculty in the humanities see keeping a healthy graduate program as part of their mission to protect the role of the humanities in the wider world. There’s no doubt about the importance of the humanities in helping us all do a better job of thinking through the problems faced in the world outside the ivy walls. I’m less sure whether producing an excess of Ph.D.s helps promote the value of the humanities in general. Whatever the explanation of how universities benefit from producing more humanities Ph.D.s than the market will support, the question remains: Is it fair to the Ph.D. students? The Modern Language Association recommends “graduate programs routinely send applicants … data on the placement of recipients of PhDs from the department in the last three to five years (names of institutions, numbers of placements, fields of specialization).” Do humanities departments routinely make this sort of information available on the web? (Economics departments typically do.) I did some spot checking. Harvard does. Yale does. Michigan does. (My university, UC Santa Barbara, mostly does.) At three other major public universities I checked—nope. My suspicion is that humanities departments that place well despite the abysmal market are more upfront about placements than are departments with less enviable records. Nothing I’ve said here will be new to anyone in the humanities. What’s more, the Modern Language Association, the American History Association, and others deserve credit for recognizing the situation and doing what they can about it for decades now. The problem does not lie in particular universities; the problem is that each university’s reasonable behavior adds up nationally to more humanities Ph.D.s than there are jobs for. Everyone wants some other university to shrink production. One more thing. Humanities Ph.D.s do find jobs. After all, one has to be very smart to get into a Ph.D. program, and very persistent and talented to earn the degree. Unfortunately, while humanities Ph.D.s can find jobs outside academia, the financial reward isn’t much at all considering the 6 to 10 years the Ph.D. takes. The National Science Foundation reports that the average annual salary for new humanities and arts Ph.D.s who do have a job is about $52,000 a year. A comparable salary number for people with a bachelor’s in any field, aged 30 to 35, with full-time employment is about $61,000. It’s a depressing state of the world.